Cooking with the oven can make life a lot easier, with baked goods and Sunday roasts left to cook while you chill in front of the TV. But setting the oven to the wrong temperature can not only potentially ruin your dinner, but your kitchen as well. With ideal cooking temperatures varying depending on which type of oven you have, such as convection ovens with fan-forced capabilities, you wouldn’t be alone if you’ve accidently burnt or undercooked food. 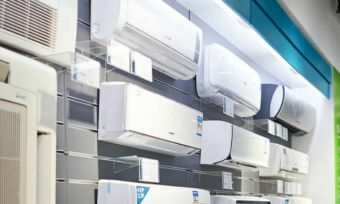 With plenty of online recipes and packaged foods indicating their ideal cooking temperatures, using the oven has been made much easier. But for those who may be a kitchen novice, or are looking to expand their culinary horizons, Canstar Blue provides a handy temperature guide for a variety of foods, helping you perfectly create whatever you’re craving – without fear of burning the house down! Low oven: A low oven of 120-150°C is good for long, slow roasting, especially for tenderising the tough cuts of meat. This is useful for many meals with high protein ingredients like meat or eggs, which end up tough and chewy if you overcook them. Medium oven: A medium oven means an oven is heated to 180°C. This is a good baseline temperature for everything from cakes to pasta bakes to apple pies. If you’re not sure what temperature you need or how long to cook it for, set it to 180 and keep an eye on it. High oven: A high oven means heating it to 200-230°C. This is great for quick-roasting lean cuts of meat and fish. Now read on for the specifics. It wouldn’t be a Sunday roast without a side of roast veggies, with oven-baked vegetables a good way to not only get your daily servings in, but make a chilly winter’s day that bit more bearable. With plenty of vegetable varieties fine to go in the oven, what you decide to cook will also impact for how long and at what temperature you should cook with. 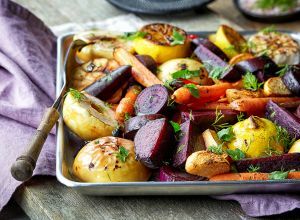 For those looking to cook the traditional roast veggies, such as carrots, onions, potatoes and pumpkin, cooking times will generally fall between 30 and 45 minutes at a temperature of 220°C. Other popular veggies, including zucchini and capsicums, will take between 10 and 20 minutes at the same temperature, as does green beans and asparagus. Cooking times will be dependent on your oven model and type, as well as how you like your veggies, with personal preference impacting how long you leave your food in the oven for. Of course, no one likes their veggies burnt to a crisp, so it’s always best to keep an eye on your oven, regardless of what you put in there. A popular option for the Christmas table, roast pork – in particularly pork crackling – is a fan favourite for many. While families have different opinions on how the pork should look when finished cooking, either with a bit of pink in the middle, or cooked throughout, how you should cook your pork will be dependent on what cut of pork you’ve picked up from the store. For a leg of pork with rind, an oven temperature of 220°C is generally recommended to begin with, before a temperature drop to 180°C for the second half will likely leave your dinner guests impressed. The weight of your cut will also influence how long you leave pork in the oven for, with 15-20 minutes per 500g of meat the general rule of thumb for most pork cuts, although the rind crackling a good indication that the temperature is ready to be dropped. Other pork roasts such as pork loin, pork rack or pork scotch fillet will generally take longer to cook than pork leg, so always keep an eye on what you’re cooking to ensure you’re left with a succulent pork roast. 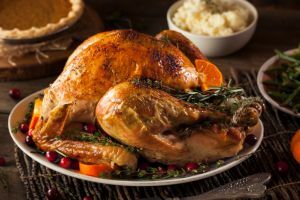 While generally synonymous with American Thanksgiving, roast turkey has also become an increasingly popular option for Australian households, with the lean meat providing plenty of health benefits without the fat. Cooking times will vary depending on the size of the turkey, as well as whether or not you’ve gone the full nine-yards and stuffed the turkey as well. A good rule of thumb is to base your calculations on a 4kg turkey, altering it to suit your bird. For larger turkeys, a cooking time of 90 minutes plus 20 minutes per kilo, with birds under 4kg can be cooked for 90 minutes plus 70 minutes per kilo. Turkey can generally be cooked at 180°C, although for larger turkeys, dropping the temperature to around 160°C may help balance out the longer cooking time to ensure you’re not left with overcooked skin. If you’re looking to roast just a turkey breast and not the whole bird, you can ramp up the temperature to around 200°C, cooking for 30 minutes per kilo of meat. 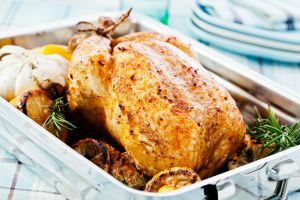 Roast chicken has been a classic within Australian households for years, and while popping down to Woolies to grab a roast chicken is tempting, for those looking to cook one themselves, it’s easier than you think to put a juicy chicken roast on the table. At an oven temperature of 180°C, cook the chicken for 25 minutes, before lowering the temperature to around 165°C and cook for another 45-60 minutes, depending on the size of the chicken. To be extra sure that your chicken has been cooked to perfection, a digital thermometer is a handy tool, with a reading of 65-70°C indicating that the chicken is ready to be served. It’s important to ensure your chicken is properly cooked, as you might be left feeling a bit under the weather the next day – or worse! 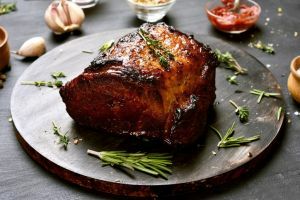 With plenty of options when it comes to cooking beef, oven roasting is a traditional favourite, although what type of cut you have will affect the temperature and duration you leave it in the oven for. Personal preference will also be a big factor here, so be sure to check with your guests what they’re after before putting it in the oven. For Rib eye, rump, sirloin, fillet and rib roast, an oven set at 200°C will get the job done, with those after rare only having to wait between 15-30 minutes, while Medium lovers will have to wait an extra five minutes and those preferring their beef well done are recommended to cook between 25-30 minutes. For those cooking beef silverside, blade, round, topside, eye round or oyster blade beef, drop the temperature down to 160°C and cook 20-25 minutes for rare, 25-30 for medium, and 30-35 for well done to leave guests feeling full. Similar to beef, a lamb roast will be dependent on not only which part you’re cooking, but your personal preference as to the meat. Topside roasts and lamb rumps will need an oven temperature of 220°C for 15-20 minutes for rare, 20-25 minutes for medium and 25-30 minutes for well done. 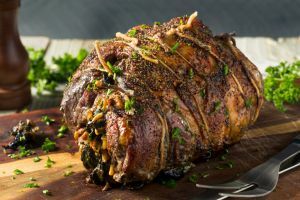 Rack of lamb and crown roast will require a slightly lower temperature of 200°C, while requiring a minimum 20-25 minutes for rare, and up to 45 minutes for well done. Finally, if you’re cooking loin, leg or shoulder, you’ll only need to preheat an oven to 180°C, with cook times between 20 and 35 minutes depending on your preferences. 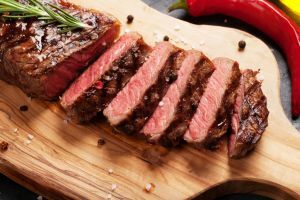 If you have an oven thermometer handy, or are looking to stay on the safe side of cooking, the NSW Food Authority has a simple list of the minimum core temperatures that you will want your meats to reach. While somewhat debating, as some meats may rise in temperature when taken out of the oven, reaching the temperatures below should set you up for a memorable dinner. For poultry, inserting the thermometer into the inner thigh near the breast should give you the most accurate reading, while for red meat such as beef, pork and lamb the thermometer should be inserted into the centre of the thickest part, away from bone, fat and gristle. Which oven is the best for baking? As baking will depend on your style and type of oven, you may get different results even though you’ve followed the set instructions. As different ovens use different fueling methods, as well as transmit heat differently, you may not get a consistent heat throughout the oven, which can ruin your baking attempt. As a result, it’s best to make sure you understand your oven before you volunteer to cook the Sunday dinner, with fan-forced convection ovens operating completely different to the older styled gas ovens, meaning you may have to alter your timing in order to produce the dinner that leaves mouths watering.